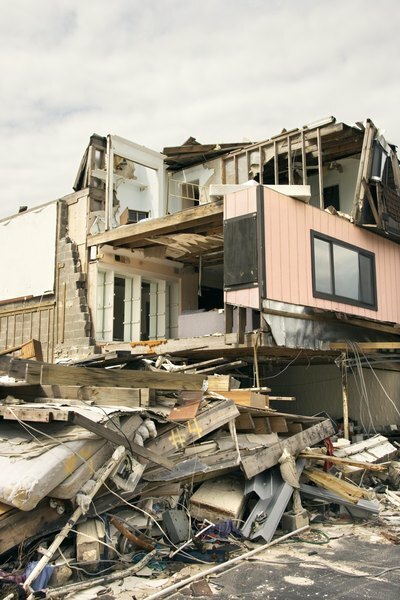 Hurricane damage usually is covered under homeowners insurance. Homeowners insurance policies normally cover fire, theft, vandalism and storm damage. Floods and earthquakes are usually excluded from the homeowners policy, but may be covered by separate policies. Many policies cover related expenses, such as the cost of temporary housing while your home is being repaired. If you are dissatisfied with the outcome of a claim, whether or not you can sue depends on the specific problem and the language of your policy. The arbitration clause in your homeowners policy takes precedence over the merits of specific claims. Not all states allow these clauses, although about half do, and even where they are allowed, not all homeowners policies include them. If there is an arbitration clause in your policy, in almost all instances, you don't have a right to sue your insurance company. Instead, you must submit to an arbitration process in which you lose many of the rights you normally have in court. A 2009 Center for Responsible Lending study concluded that in arbitration cases, consumers prevailed only about 4 percent of the time. One reason for the imbalance, the study found, is that those arbitrators who ruled against consumers more often became popular in the industry and received many more future cases. Most insurance disputes are over coverage and settlement amounts, and are independent of the merits of the actual repairs. If your insurance company maintains you are not covered for your claim, and you cannot reach a compromise, filing suit may be your only choice. When the settlement amount is disputed, in most cases, you can achieve a compromise with the company that is more cost-effective than filing suit. The settlement may be less than you believe you deserve, but unless the damage is considerable, you are probably better off settling than going to court. For a helpful discussion of the settlement process, see the Nolo Press website article "Tips for Negotiating With an Insurance Company" in the References section. In most circumstances, your insurance company is not responsible for bad repairs. The claims process primarily involves you and the claims adjuster. The usual conclusion of the negotiation is your mutual agreement to a settlement amount. At that point, you are responsible for hiring competent contractors to carry out the repairs. If they are unsatisfactory, your dispute is with the contractor or whoever did the repair work. In some instances, circumstances in the settlement and repair process can make the insurance company potentially liable. A house that has lost a roof in a storm, for example, may need preliminary emergency repairs or be subject to even more damage. If the insurance company refuses to pay for these repairs until you agree to accept its overall settlement offer, it may incur some liability. If you didn't have enough money in the settlement to repair your house properly, a court may invalidate the original settlement agreement because you signed it under duress and hold the company responsible for the cost of properly repairing your house. In complicated insurance matters of this kind, consult a real estate attorney.